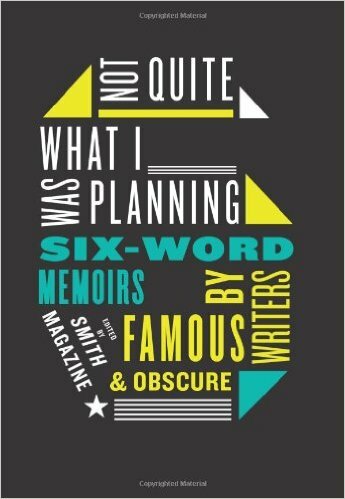 Just discovered this book titled Not Quite What I Was Planning: Six-Word Memoirs by Writers Famous and Obscure. 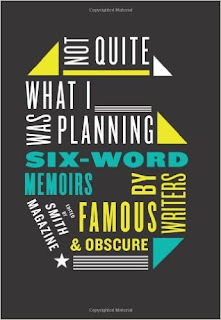 (Should six-word be hyphenated? Does it matter? It's distracting me.) The title grabbed me the way flash fiction does: it's short! I can read it easy! I know that's illogical, considering how dense good short writing has to be, how much it makes you think. Maybe I just want to think sometimes instead of read. Exercises that have helped me a lot over the years involve strictly enforced word counts. 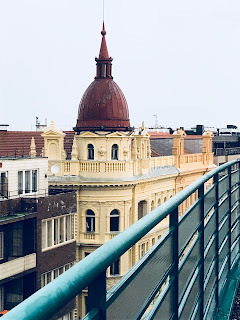 Recently I answered the question "Why did you attend your first writing workshop?" I had to write it in 100 words or less. Doesn't sound like a big deal until you actually try to do it, and the discipline it requires makes the writing sharper, clearer, and more succinct. It also works your brain in a different way, which feels refreshing after long sessions thinking about craft, content, or character. Here are a few examples. They sound a little like haiku when you read them out loud. She said she was negative. By the by, you can write your six words and put them on a T-shirt! Because of course!